Description: She Who is Holy and of great renown; Compassionless, violent chthonic Goddess of gloom, death and the dead; Receiver of offerings made to the dead; She Who is full of rage, greed and loneliness; Embodiment of the night-time aspect of the feminine, powerful, insatiable sexuality that seeks solace for the wounds of accumulated rejection in physical union; Queen of the wilderness at the world's end; She Whose food is clay; Ruler, with seven judges, of Kur-nu-gi-a 'The land of no return', the dry, dark enemy territory, where at each of it's seven portals (some say fourteen), the descending spirit must divest one garment or ornament [the roles of life] till shehe arrives as naked as the Queen Herself; Granter of peace and wisdom; Giver of the gifts of fertility and growth; She Who nutures the buried seed; Birth-giving Mother, Shw Whose black hair 'swirls around Her like leeks'; Owner of the Tablets of Wisdom; Fallow season of earth; She Who is the darkness to Her Sister Inanna's light. Some call Her realm Irkalla, Kigalla,or Aralu. To Whom are sacred: wood (symbol of impermanence and decay); lioness; lion-cub; horse of death; river of death; boat; rain-bow garden; lapis-lazuli (Her temple is made of it); the number 7 (symbol of wholeness in Akkadia). Icon: She is sometimes portrayed as lioness-headed suckling cubs); sometimes She is shown in a boat kneeling on the horse of death). Male Associates: In the beginning She ruled alone, but eventually Her consort was Nergal, of Kutha. A sky-god, regarded as the sun of the summer solstice and noon-day heat, the harbinger of suffering and death. She is also associated with Gugalanna, Bull of Heaven, [possibly a title of Dummuzi], who rests with Her six months of the year and rises again in early spring [perhaps March when the planet Taurus arises]. Canaanite name for Her: Allatu, below. Her scribe is the Goddess Belit-Sheri, [Who is possibly associated in some way with Belili, qv Zarpanit.] Belit-Sheri is also said to be the sister of Tammuz (but in his earlier form as Dummuzi, his sister is Geshtinna, Goddess of wine)]. See Dam-Kina for elucidation of the syllable Ki in Her name. Variant: Erishkegal [poss. a typo of mine, FW]. Semitic name for Her: Ganzir. *Alternate name, or language variant: Irkalla. Assimilated to, identical with, or title of: Nin-Azu. Assisted, in judgement of the dead, by: Nin-Edin. Also called Nin-Ereshkigal, Lady Queen of Deadland. [Presumed] Daughter of Ningal, Great Lady [since She is Sister of Inanna, Queen of Heaven, Whose Mother is Ningal]. Also called Ninkigal, Lady of Deadland. for Ereshkigal Allatu `---'. 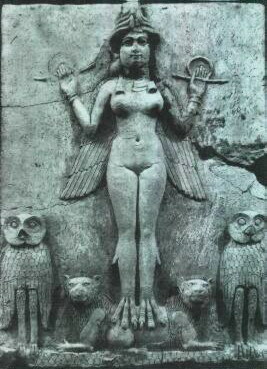 1L1TW, Sumerian, aspect of Sumerian Ereshkigal, `Queen-of-deadland'. Allatum, `---'. 1L*TUM, Sumerian [? ]; language variant of Sumerian Allatu `---'. Nin-Kigal, `Lady-of-deadland'. Sumerian. Alternate name for Ereshkigal. Nin-Erisgal, NYN-=RYSG*L, var. of Ereshgigal. Sources: Britannica v9 736cd; Cotterell DWM 36, 39; Monaghan BGH 97-8; Wolkstein & Kramer IQHE 55-7, 64-7, 89, 157-8, 160-1, 168. Associated with Belili, Who is linked with Zarpanit. Perhaps related to Lada, Who is linked with Lat. See also Al-Lat, Who is linked with Lat. Description: She Who is insatiable, as are Her two Daughters (Who were named by Solomon Give and Give. To Whom is sacred: horse-leech (a fresh water animal akin to the medicinal leech with thirty teeth; it swims into the jaws of drinking animals and fastens on the back of the throat -- as a type of relentless greed it takes its name from Her). She is identified with Lamia, Who is linked with Lamashtu. title, or alt. name for Nin-Edin `---'. Description: Goddess who records all human activities who assists Ereshkigal at the judgement of the newly dead. Description: Sleeping naked Death who holds the sleeping dead in the perpetual embrace of a mother. Identical with, assimilated to, or title of Ereshkegal.